MMS JULY 2018 34 mmsonline.com QUALITY GAGING TIPS Measurement Tools The Modular, Multi-Gage Concept The idea of the multi-gage is to take all of the elements found in high-precision comparative gaging and turn them into modular components. When looking at the parts of a comparative gage, it is easy to see that there are very basic compo- nents common to them all. For example, good comparative gages have solid reference anvils (or contacts), a sensitive contact, part references (backstops) and a readout, all tied together with a robust frame for stability. 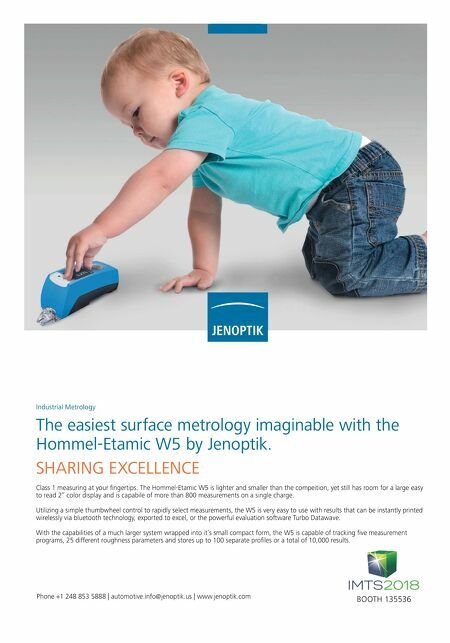 The use of these standard components enables multi-gage measuring devices to be designed and assembled for the widest possible range of workpieces. Whether the workpiece is a basic shaft with just a couple of diameters or a complex transmission shaft with multiple diameters using differential probes, concentric- ity and length of the final configuration comes down to selecting the right standard elements to complete the measuring task. Since the accuracy is built into the components, all of the alignment relationships are inherent, leading to fast assem- bly and high performance. Multi-gages also can easily be reconfigured for similar or different applications, as they are constructed of all common elements. So, where a traditional comparative gage may have been built for one shaft of a certain size that has five diam- eters, a new multi-gage can easily be adjusted for five different shafts having different diameters at different locations. Flexible gaging would be even better with a f lexible gaging instrumentation package, such as a PC-based workstation or an industrial tablet that could store all the various programs for the parts to be measured. However, there needs to be more than just the gaging computer to measure and store the data. All information from the probes and sensors used in the f lexible gaging must reach an interface that enables the user to make gaging decisions. Just like standard mechanical elements for diameters, runouts and lengths, there are standard electronic mod- ules for linear variable differential transformers (LVDTs), digital probes and air sensors to gather dimensional information from the fixture to be used on the gaging computer. If the operator needs classification of the parts through signal, lights or indications for sorting, there are often I/O mod- ules available as part of these custom-configu- ration systems. 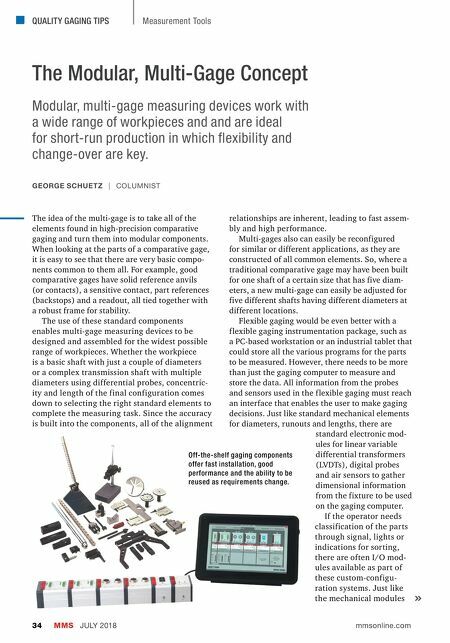 Just like the mechanical modules GEORGE SCHUETZ | COLUMNIST Modular, multi-gage measuring devices work with a wide range of workpieces and and are ideal for short-run production in which flexibility and change-over are key. Off-the-shelf gaging components offer fast installation, good performance and the ability to be reused as requirements change.